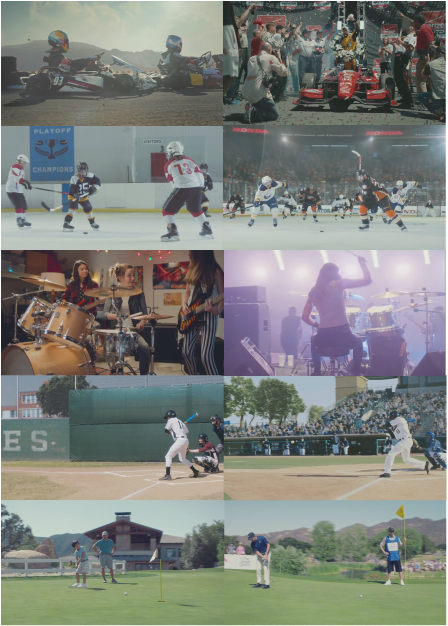 These five commercials were all part of Honda's "The Power of Dreams" marketing campaign of 2015. In my first stint working as a previs supervisor, I oversaw a team that was put to the test visualizing a high concept that depicted the multiple life phases of a main character living out their childhood dreams. With five different spots each involving roughly four different settings, the asset load added up quickly, and in all there were fifty-eight characters, nineteen environments, and forty-one props and vehicles built or repurposed for the project. For each commercial, a camera setup was used that included one-hundred twenty DSLR still cameras arranged on an arc rig, with additional motion control rigs and a motorcycle-mounted Phantom camera. Photography via these rigs and high-speed cameras provided a "bullet time" effect, which could be speed-ramped to heighten different moments as the cameras rotated around the subjects. Each of the five commercials had their own unique challenges, but they were all able to be previsualized in under two weeks thanks to the team effort. For more behind-the-scenes information and photos from the shoots, visit the design studio Laundrymat's website.